Most old time Bangaloreans will vouch that shopping in the noisy, congested lanes of Chickpete and Balepete is a unique experience and more importantly, easy on the wallet. Bangalore Pete (city), built in 1537 AD during Kempegowda reign, is now a thriving wholesale market. Though most people who visit here are retailers, who buy their supplies at wholesale prices, there is also a huge retail shopping populace who regularly visit for the economical prices and the sheer range on offer. It was a long time since I went shopping in this area; so when my aunt requested me to accompany her for some purchases on the eve of Dasara’s gombe habba (doll festival), I happily agreed. I came to know from her that festival eve is one such occasion for people to shop here. The other occasions are weddings, family functions and any other occasion when one would have to purchase in bulk or buy a whole range of products. If you have a look of the Pete area on Google map, it’s almost an oval shaped area bordered by Goodshed road on one end and Corporation circle on the other. The area is bisected by Avenue Road, a busy one-way street that starts from Mysore Bank Circle and reaches City Market. On the north it is bordered by Kempe Gowda Road and Majestic bus-stand and in the south by Mysore Road. The entire area with its multiple one-way streets can be a maze for first timers, hence it is safest to take an auto-rickshaw and get off at Abhinay Theatre on BVK Iyengar Road. Walk down and take the left to enter the narrow Chickpete road. Shops on either side display colourful sarees – silk and otherwise, dress materials and dhotis at prices that are atleast 20-30 percent cheaper than the local retailer. Before you plunge into a shopping frenzy, be warned that almost every shop has a ‘Fixed Rate and No Return’ policy. Each shop has a pushy tout hard-selling the shop to prospective customers. Byrappa & Sons. Pic: Poornima Dasharathi. Mohan Fashions is one of the many small shops full of dress material, which my aunt and I decide to visit. As we sit on the soft cotton mattress spread out in this tiny shop, an expert salesman displays dress materials of every range. “That set costs Rs. 350 and the mica print costs Rs. 400”, he rattles with expert ease of a person who knows his wares. When I chide him about the effortless nature with which he mentions the prices of each of the thousands of products, he shrugs saying that he has over 10 years of selling experience. He goes on to mention that the shop itself has been around for 50 years, which is apparently new by the area’s standards. Byrappa & Sons next door, he mentions has been of one the oldest shops around in the area. As we come out, we understand what he means. Byrappa & Sons is housed in a building that might have easily been a century old. Many of the buildings here, even though dilapidated, are architectural reminders of the old Mysorean era. The shops having been selling for so long that they have become brands. Rukmini Hall, Byrappa & Sons, Kuberan’s Silk etc top the list of places to visit when there is a marriage in the family. A view of Chickpete. Pic: Poornima Dasharathi. Make it a point to enter one of the smaller lanes which you might overlook as the gully is so small. Chances are that you might enter an area that might once have been someone’s backyard; now a set of small shops and a fruit stall might greet you. One such lane I enter is DR Market, DK Lane (Devaraja Market, Diwan Khana Lane). This once residential area is now full of hole-in-the-wall shops. Srinivas, the proprietor of a small sandalwood shop explains that these were once part of huge bungalows divided among brothers, yielding each a share equivalent to a one BHK apartment. The small lane into which his shop opens was once a conservancy lane. He tells with pride that his house is around a century old and points to the leaky thatched roof as proof. As we step out, a scooter laden with wholesale goods, rushes through, giving us a warning hoot to make way. Jewellery store in Raja Market. Pic: Poornima Dasharathi. As you come down Chickpete road towards Avenue Road, the sarees and other apparel give way to jewellery. Nagarethpet or Nagartapete is full of shops that display gold and silver ornaments. Nagartapete is also home to the famous Raja Market. Apart from the display shops, there is a thriving set of goldsmiths who will produce the perfect pattern on your gold pendant. ‘Nagarta’ is the name of a community of jewellery traders. “Do you know the famous Puttana Chetty of the Puttana Chetty Town Hall fame? He was a Nagarta”, explains Srinivas the sandalwood seller. As I stand at the junction of Avenue Road and Nagarethpet Main Street, I regret that we have not been able to maintain the heritage of this place. All that remains of this once beautiful Avenue Road are two old pillars of those times that marked the entrance to the chowk (intersection). Now worn out and mired with cable wires, it is impossible to visualise its history. 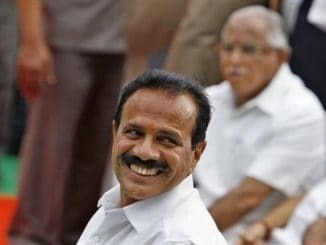 But of course the traders here are busy with their businesses and even Kempegowda would have scoffed at history while there is money to be made and lives to be led. Down Avenue road on either side are shops that trade all sorts of items. Decoration items in Mamulpet. Pic: Poornima Dasharathi. A lane parallel to Chickpete is Mamulpete. One can go shopping here for readymade garments. Down the Belli Basavanagudi Street, enter the Laal Building for readymade dresses for kids. There are some plastic items on sale in Mamulpete, but for a really huge marketplace for such shops, go to Kumbarpete. Aralepete or Cottonpete, as the name suggests, has textile wholesalers. Balepete might once have been famous for bangles and infamous for its nocturnal activities, but now markets everything from readymade garments to bedding and photo frames and is a thriving commercial area. Akkipete, next to Balepete, known for rice mandis, also has small kirani shops, tailoring shops and silk weaving. If there is a wedding in the house, chances are that you will be directed to Sultanpete for invitation cards. Sultanpete is full of shops that trade paper and related products. The Sultanpete Main Road becomes Old Tharagupete Main Road as it crosses the Arcot Sreenivasachar Road. The old Tharagupete is a wholesale market for oil, grains, vegetables etc. Down the Arcot Sreenivasachar Street are a line of shops that glitter with brassware, copperware and house-hold steel utensils. & vegetable produce. There is a popular story that Kempegowda marked the Doddapete road by drawing a plough northwards from the City Market. Doddapete road (which becomes the Avenue road) has shops that trade all sorts of products (unlike Chickpete that specialises in cloth). I buy a nice file folder here for Rs.15; it would have been atleast double the cost at Gangarams. The locals are quite friendly and give you good directions in case you are lost in the maze or take a wrong lane, mesmerised by the alluring array of items on display. Every small lane has a fruit or chaat centre for a quick snack. The bigger roads have restaurants. Udupi Krishna Bhavan is a major landmark in the area. There is an SLV on the lane off Nagartapete. There are many fast food Darshinis on Avenue road. There are also other facilities such as public toilets. To get back to the city, you will have to catch an auto from the main roads like Avenue Road or BVK Iyengar Road because hardly any empty autos ply inside the small lanes. As we walk towards the designated auto stands, with our loaded shopping bags, I think of the people I saw here. The delivery boys on two-wheelers, who zoom out of the small lanes, with the goods tied on to the back seat; jean-clad girls having an ice-cream while waiting for their friend to complete her shopping; aunties with young brides-to-be in tow sitting in front of glittering silk sarees; small shop-owners who buy Ganesha idols for good fortune, husbands who bring the car through the narrow lanes and help in loading the bags– all as colourful and varied as the shops here. It was not just bullet trains and private participation. Namma Bengaluru got many trains that will help you travel to and from the city easily! This city has little provision for toilets for women in the city. 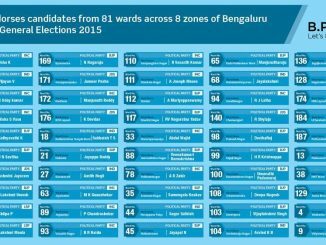 B.PAC had endorsed 50 candidates across parties for the BBMP Elections. 23 of them have been elected as corporators. A participant from the B.CLIP program was elected too. Thanks. Yes there are also branded apparels (I spotted a Raymonds store in my last visit) here with prices lesser than retail shops. Very true about the two faces of Bangalore. I have met many friends who dont know anything beyond MG Road. I hope these articles help them. A new-to-Bangalore friend once argued, “Where else to shop apart from Forum?”. There are two Bangalores in Bangalore, one always in focus other always neglected.